Negotiating the IPCC SPM | Climate Etc. The iisd is a reporting service for environment and development negotiations. They provide fascinating context and details regarding the negotiations last week in Sweden: Summary of the 12th session of Working Group I (WGI) of the Intergovernmental Panel on Climate Change (IPCC) and the 36th session of the IPCC. Via a video message, WMO Secretary-General Michel Jarraud highlighted that the improved knowledge on anthropogenic contribution to climate change forms the basis for mitigation and adaptation action. Noting the strengthened evidence on temperature increase, sea level rise, glacier melt, and extreme weather events, Jarraud said that the work of WGI is also central to the negotiations towards a climate agreement in 2015. He welcomed the special attention the IPCC has given to the socio-economic aspects of climate change, for example of monsoon rains and El Niño. Via a video message, UNEP Executive Director Achim Steiner underscored that, while the science keeps evolving, the great challenge of climate change demands new policies in all sectors. In the context of the UNFCCC working towards a new agreement in 2015, Steiner highlighted that the work of the IPCC is important for better understanding both what is happening in the climate system and the benefits of climate action in terms of new jobs, markets and opportunities for the green economy. Halldór Thorgeirsson, on behalf of UNFCCC Executive Secretary Christiana Figueres, stressed that AR5 goes further to meet the needs of the UNFCCC than previous assessments. He also highlighted the ongoing review process under the UNFCCC of the agreed 2ºC upper limit for global temperature rise. Lena Ek, Minister for the Environment, Sweden, welcomed participants, recalling the 40th anniversary of the International Conference on the Human Environment in Stockholm celebrated in 2012. She underscored that the effects of climate change can already be seen in the Nordic countries, and announced the launch of “The New Climate Economy” initiative on 24 September 2013 in New York. OBSERVED CHANGES IN THE CLIMATE SYSTEM: On the headline statement, which states that warming of the climate system is unequivocal and, since 1950, many of the observed changes are unprecedented over decades to millennia, Saudi Arabia said the statement was “alarmist,” urged qualifying the terms “unequivocal” and “unprecedented,” requested using the year 1850 instead of 1950, and called for a reference to slowed warming over the past 15 years. Germany, Australia, Chile, Spain, Fiji, New Zealand, the US, Saint Lucia, Tanzania, Mexico, Slovenia, the UK and others supported the statement as presented, with Germany pointing out that AR4 concluded almost the same. Canada pointed out that factors other than warming will be the emphasis in the future. The Russian Federation proposed “changing,” rather than warming of the climate system. After some discussion, Saudi Arabia agreed to accept the statement as presented. Atmosphere: Addressing the keynote statement to the sub-section, Germany, supported by Belgium and Ireland, argued for an opening sentence singling out the fact that the first decade of the 21st century has been the warmest decade since 1850. The WG Co-Chairs and CLAs suggested focusing on 30-year time periods due to the multi-decadal nature of global warming. Canada proposed adding the word “successively” for the sentence to read that: “Each of the last three decades has been successively warmer at the Earth’s surface than any preceding decade since 1850.” This language was supported by the CLAs, Slovenia, the US, Austria, the Netherlands, New Zealand, and Trinidad and Tobago, and eventually accepted. Extensive discussion took place throughout the week on text on global temperature increase both in plenary and informal consultations. The text initially referred to both: global mean temperature increase during the period 1901-2012, and temperature change between 1850-1900 and 1986-2005. Debate revolved around, inter alia: reference years used; whether to discuss these two concepts in a single bullet point, which, some said, would lead to confusion among policy makers; placement of text on temperature change; and use of the term “pre-industrial.” The US cautioned against mixing information from trends with information from differences between time periods, and suggested two separate bullet points. While some countries called for using the period 1850-1900, the CLAs clarified regional trends were sparse prior to 1901, and noted the availability of three datasets for the period 1880-2012, and one going back to 1850 for global temperature. On temperature change between 1850-1900 and 1986-2005, Canada, supported by Belgium and the US, proposed providing context for the two time periods, referring to the former as the early instrumental period, and the latter as the AR5 reference period used for projections. Delegates debated at length whether to place this text in the observations or in the projections section. Delegates also discussed whether to use the term “pre-industrial” for the period 1850-1900, with some countries suggesting this would lead to confusion as in other places, “pre-industrial” refers to 1750. After a series of informal consultations, compromise text was introduced, which included two bullet points in the observations section, one relating to a linear trend in global temperature increase of 0.85°C over the period 1880 and 2012, when multiple datasets exist, and another, on regional trends for 1901-2012. The group also agreed to insert text into the chapeau of the section on future climate change, which, among other things, clarifies that considering observed changes between different periods is necessary to place projections in historical context. On lower rates of warming in the last 15 years, there was broad agreement on the underlying science as well as on the importance of addressing the phenomenon in the SPM, given the media attention to this issue. A lengthy discussion occurred regarding how to communicate the underlying scientific explanation clearly and in an accessible manner to policy makers to avoid sending a misleading message. Germany, supported by Belgium, Luxembourg and others, suggested adding that the rates of warming were higher in the preceding 15-year period. Norway noted that only periods of 30 years are sufficient to draw conclusions about rates of temperature change as defined in the glossary of the report. The US, with Belgium, Luxembourg and others, proposed adding that the rate of warming since the late 1990s is very sensitive to the choice of a start year, referring to a strong El Niño effect in 1997-1998. The latter suggestion was taken on board in a slightly modified form. Concerning text on the Medieval Climate Anomaly, Belgium and Ireland underscored that this phenomenon was regional in nature, unlike global warming in late 20th century, and suggested clarifying language to reflect this. Canada, supported by Norway, raised the issue of the Arctic experiencing a greater increase in surface temperature than globally, and text on this was introduced in other parts of the SPM. Switzerland proposed including the language suggested by Saudi Arabia, together with an explanation of the level of confidence. Germany questioned the adequacy of that language. The suggestion by Saudi Arabia was incorporated in the SPM text. On Thursday morning, Germany and the UK said that their objections were not noted the previous evening when a sentence on overestimates in some models introduced by Saudi Arabia was adopted. Saudi Arabia, supported by Sudan, expressed grave concerns in opening up agreed text, emphasizing that “we are in dangerous waters,” while Sudan added that opening up agreed text raises the issue of equal treatment of countries. No changes were made to the text. Quantification of Climate System Responses: On equilibrium climate sensitivity, several delegations, including Australia, the Netherlands and others, noted that the message that the lower limit of the assessed “likely” range of climate sensitivity is less than the 2°C in the AR4 can be confusing to policy makers and suggested noting it is the same as in previous assessments. The CLAs explained that comparison to each of the previous IPCC assessments would be difficult, and new language was developed adding that the upper limit of the assessed range is the same as in AR4. On GHG metrics, the text was endorsed by Austria, the Netherlands, Slovenia and New Zealand, and opposed by Brazil, who called for informal consultations, explaining this was one of the most important issues in AR5 for his delegation due to different policy implications of the choice between Global Warming Potential and Global Temperature Potential as a metric. A revised text was developed by an informal group and accepted approved by the WG. Detection and Attribution of Climate Change: In drafting the keynote message, the UK suggested adding a sentence that explicitly notes increased evidence of anthropogenic influence since the AR4. This was supported, with several different wording suggestions, by Slovenia, Switzerland, Canada, Fiji, Saint Lucia and Germany, and opposed by Saudi Arabia. A contact group developed a proposal that included text suggested by the UK. Canada proposed including Arctic warming in the context of explaining warming of continental regions, and additional language was developed. JC comment: not sure what to say here, other than that this is very high-level motivated sausage making indeed. But how do they claim they are policy neutral? I found this amusing, since Canada has little to no climate data prior to 1939.
plus there is a far amount of data that has yet to be added to archives. i would not characterize the period before 1939 as having little to no data. The Saudis have traditionally opposed including anything about AGW, but even they are mellowing a little in the face of reality. Michael, that’s your reality, not the real reality. How about carpet solar panelers and waltzing windmilla? It is quite clear that the IPCC has very little to do with science but a large amount of diplomatic horsetrading over language (to be expected from dips and pols). Facts have little to do with this report. Have you seen McIntyre’s post on the post-facto adjustment of climate models? I’ve only skimmed to report, but it appears to me that he is correct. I can only agree with Nigel Lawson;s comment that the IPCC has dragged the good name of science into disrepute. I expect that many scientists feel the same. Explain how none of the skeptics who promoted the graph from the leaked draft spotted the error in it? They all looked at it closely but somehow didn’t realize it was biased by a 1990 start point. A good example anyway of why not to leak draft graphs and draw conclusions from them! This is a graph comparing previous predictions with subsequent observation. Drawing such a graph is an extremely straightforward exercise which could be undertaken by a high school student. Simply take the earlier graphs of predicted anomalies and plot the subsequent measured anomalies on it. In drawing such a graph you don’t get to choose offsets or start points. Those choices were made and locked in back at the time of AR4 and the earlier reports, and are part and parcel of the predictions for temperature made at that time. I find this attempt to change previous predictions and obfuscate over the issue when challenged to be dishonest and extremely offensive. The lack of academic integrity on display in this adulterated graph is absolutely disgusting. This isn’t science. It is a farce. The first version used creative graphology to start the models at the 1990 peak that they clearly were not representing because it was an anomaly. Steve McIntyre did not even try to defend that original choice, nor why they didn’t show back beyond 1990 which would have revealed their upward shift more starkly against the data. The new one is an improvement from the objective perspective. And they dare call this science? Is this is news to anyone, then ‘skepticism’ is dead. That Dr. Curry’s musings pass as “skepticism” is an indication of how dead skepticism really is in many quarters. It’s rather laughable this is generating hate tweets from Mann and Schmidt or that Dr. Curry still cares what those a-hats say. The sensible “Centre”, where skepticism comes to die. The IPCC is clearly a scientific body that doesn’t do science. AGW is a hate driven movement with the slightest scratch below the surface. Just listen to Michael Mann or Al gore for evidence. “There has been an extremely well-funded campaign of distortion and it was modeled very consciously on the campaign undertaken by the tobacco companies some decades ago,” Gore said. It’s that “vast right-wing” conspiracy thing again! LOL You do realize this is certifiable babbling to be found from the homeless insane on a NYC park bench don’t you? Media accepts it as rational, tools that they are. Skepticism in science is anything but dead, Michael. In fact, it is the cornerstone of the scientific method. The politicians at IPCC are unable to kill it. Oh no, Max. Skepticism is dead. Long live the age of faith! It’s surprising, how little was ultimately changed. Some of the changes in SPM require changes also in the TS and full report, but none of these seems problematic. Little has changed Pekka? Have a look at CA how the discrepancies between models and actual data, contained in the very last official and confidential draft prior to Stockholm, were “disappeared” -as in he was “suicided“- from the final version. And the IPCC and its acolytes still dare call this `science“. If something even remotely like this came to light in the private sector, the perpetrators would go to prison for a very long time, indeed. The picture presented at CA is not from the June 2013 final draft, but from the SOD that was released for comments in October 2012. CA tells that the figure is from SOD. This murder was long premeditated; it had to be, the scene bulged with detectives aforehand. Is this relevant? Isn’t the point that everything that pertains to science in the final report must be from peer reviewed literature and “the picture presented at CA” is not. It’s relevant for the question of what was changed in Stockholm. Excuse me, please. I meant to say that the graph in question is “Approved Version Figure 1.4.” It is not in the peer reviewed literature. There’s no requirement that the graphs should be published before. The data that’s is presented in them must be, but it’s very common and perfectly in the spirit of the report that figures combine data from many published sources. How do you measure the change? By the pound? One addition of the word ‘not’ can change a pillar of the report from true to false. Let’s be specific. Remember, we are talking about a report issued by a political body using a forced consensus process. This body already had a shtick that was working (at least so it thought), and “the science was settled” to support this shtick, so why change it? Too bad we don’t have access to an actual recording. These people should be required to do their “sausage-making” in the full light of day. No “smoke-filled rooms”, unless we have recordings of them as well. That would set a fox among the hens. …oh baby. How great would that be? A recording. Come to think of it, doesn’t their charter say something about full transparency? It comes from a very odd planet indeed that the claim of political or policy “neutral” being associated to the IPCC. Skip the rhetorical and acknowledge the obvious. There is no “sensible Centre” with fanatics. AGW is rooted in fanaticism and you continue to carry water for the “cause”. Do they really expect to be taken seriously? Of course, they most certainly do. I have to say though that I’m encouraged by the muted response even among the stalwarts. Even the NYT’s which is the very belly of the beast, hasn’t been able to get themselves all that worked up. They had one front page article…above the fold I believe, trumpeting the 95 percent confidence number at the time that was leaked. Then a more muted below the fold front pager with the official release. That’s it except for an editorial and Muller’s column which amounted to nothing more than hand waving and self promotion. What a difference 5 years make. Certainly we are over the trillion mark in malinvestment in “green” co2 rationalizations. Worse our schools have descending into indoctrination camps even in the “sciences” for generations to come. AGW is institutionalized and the ambivalence or no growth phase will leave the worst elements in incubation. Similar to the New Deal smaller structures created in the 1930’s. The IPCC should have been put down 20 years ago or never created, now the train wreck is that much further down the rail the actual “science” is even less relevant politically. It’s part and parcel of the phony Keynesian fiat financial system at this point. It will be run on authority not reason for some time to come just as the deficit ridden economic system does. The IPCC can be papered over just as the media can paper-over the Obama administrations track record. Even in the 4th century AD there were people pining for the Republic to be restored to Rome. All evidence of Empirical decadence didn’t change or help their cause at all. AGW isn’t about “science” in bulk but social decline. A dreamy lot of skeptics are found here arguing the contrary. Any claim to policy neutrality is nonsense. The opening statements are pep talks aimed at firing up the delegations. The message is clear: we’re counting on you all to supply the ammunition we need to get us agreements in 2015! This SPM is key to “…meet the needs of the UNFCCC…!” That’s a rather strange use of words–it’s hard to tell exactly what an international bureaucracy’s needs are, beyond self-aggrandizement and never-ending expansion. Giving Mr. Thorgeirsson the benefit of the doubt I suppose he meant this need: “At the very heart of the response to climate change, however, lies the need to reduce emissions.” [http://unfccc.int/essential_background/items/6031.php] That doesn’t leave much room for WGI to come up with anything new. I’ve always wondered why we still go through the anachronistic IPCC WGI motions, since the foregone conclusion was present in the seed. Are we to expect that the IPCC will ever doubt the basis for its existence? True, true, it is aggravating seeing our tax dollars at work… subverting science, the culture, the economy and even common sense. You’re on the wrong site and topic here, very little to be found. I caught that as well. Why should any of us be concerned with “meeting the needs of the UNFCCC”? Well there is one need of theirs we should be concerned about – their funding. This is simply another in a long line of examples of why the UN is a waste of money. Just another instance of demonstrating the difference between real science and ‘climate science’. It sort of gets to the true cost of the Orwellian perversion of the word “science” aside from the trillions of misused material resources wasted on AGW so far. Contamination may not be as limited as assumed in “real science” either. They are on a different planet, apparently. Who does Europe give a Nobel next? Michael Mann? This wasn’t much news in 1988 to the much fewer who followed the AGW meme along the inception road. It’s quite redundant now and makes the claims of finding middle ground look even more foolish. Someone mentioned this the other day, appropriate. They addressed the pause, not because the actual data tended to disprove their models, but only because the pause has received media attention. This is a question of ETHICS –> not a very popular topic with politicians. They quite simply can NOT ethically say that they are policy neutral –> so they say it anyway. Hypocritical self-limiting deceptions never end well when Nietzsche’s supermen finally decide to take their leave of the Left’s bizarro world antics–the Left cares about the property of others only after they’ve decided to take it. They IPCC gave some ground (which is more than nothing) but they knew they were stuck with an advocacy document at best. Politicians, scientists and writers can write whatever they like but the easy ride in climate story telling is over. Arguing models is a difficult final position when the observed data is there to challenge every wild tale. It would seem that someone should gain traction in this narrative by sticking to the facts (Judith’s approach is a good model?). It appears many of the delegates had their minds or policy already made up. Why even bother? “On lower rates of warming in the last 15 years, there was broad agreement on the underlying science”. What underlying science??? Hasn’t it been stated in AR5 and many times elsewhere that the IPCC simply does not know what caused it? The whole thing is breath-taking. Judith calls it “very high-level motivated sausage making“. That’s good, but I’ll go with cwon14 : Orwellian. cwon14 is correct but depressing. Dr. Curry wants to “save” the AGW movement from itself, clearly missing the evil it truly represents. cwon14, I’m not sure why your extremely narrow vision has caused you to be so utterly blinded by your biases that you seem to be incapable of reading with any degree of comprehension. Or perhaps you have merely unilaterally and arbitrarily redefined “consensus”, “sustain” and “save”. In which case, perhaps your rhetorical talents belong in the camp of Mann groupies. Now, for heavens’ sake, please stop acting like such an ignorant and ungracious “delinquent teenager”! Grow up and get a grip, eh?! Always respected you cwon, but your view of the world is as narrow and Manichean as the other side. GaryM, another guy I respect and much more measured than you, insists that conservatives are more honest, more willing to admit mistakes, and by implication I suppose, better people. That’s all nonsense of course. As to Dr. C., I see nothing in the way of weaseling or “middling.” Do you want her to start tossing hand grenades and Molotov cocktails? She’s a hero as far as I’m concerned, having shown much courage and integrity in her willingness to speak the truth as she sees it, and in her ongoing deconstruction of the IPCC. Trying to take Josh’s title of the biggest Judith bashing douche? Or does Hilary have it right about your reading comprehension? I’d like to say I care what you thought but in the end I’m part of the Mongol horde that is going to end this social rot of AGW so I really don’t. Looking for a “sensible center” between the total immorality of the Greenshirt left and its victims. Suggesting the IPCC be put down 20+ years too late and for all the unimportant and obscured reasons is exactly how “middling” should be defined in the dictionary. Your hero sits on a fence with no moral or intellectual basis to do so. It’s simply politically correct within her tribe to do so and even that seems “gutsy” within the establishment. It’s pure nonsense that the MSM and peers gives her opinion more weight due to her many other leftist credentials (consensus member) and sociology while anyone away from the tribe is discredited at once for speaking more honestly about the corrupt motivations of the AGW agenda. The David Brooks standard of deciding just how much criticism and from whom it is acceptable to the consensus establishment. It’s like being tied to a chair and being forced to listen to NPR debate almost anything when you know 40-60% of the population doesn’t even exist in their minds from the start. So her dissent weight is totally out of proportions to her actual views which border on climate change nostalgia. Sorry Pokerguy, this is pathetic comparative relational morality and political correctness at its worst. Like condemning Putin because he’s “homophobic” rather than a former KGB murderer with a whole trail of dead bodies leading to his door over decades or expressing admiration for Stalin. Of those three “issues” which ticks off the leftist establishment the most? Seriously, you need a better hero standard and to get the issue more proportional. If I seem bombastic Pokerguy I have one question; How many people do you actually think have died under forced global carbon rationing rationalized by corrupt politically motivated climate “science” Pokerguy? There are actually people dying for the Ivory tower and sanctimony of the consensus on AGW. Her statements and arguments are often factious and certainly late. If her only defense are the immorality of her silent peers or worse Greenshirt activists and “believers” that is a sorry defense indeed. > Always respected you cwon, but your view of the world is as narrow and Manichean as the other side. All cultures are not equal. All systems of values are not equal. Do I really need to post a list of recent history and the “isms” that have made the slaughter of hundreds of millions possible? Third, and most pertinent, progressivism, unlike conservatism, includes dishonesty as a positive value. Steve Schneider was not saying anything new to movement progressives. Saul Alinsky said it more eloquently before him. Not only does the end justify the immoral means, it requires it. With respect, I do not believe you know the actual history of movement progressivism. And it is unlikely you ever got much of a fair exposure to genuine conservatism unless you did a lot of reading on your own. What I say about progressivism comes from the mouths, and books, of progressives themselves. Not that anyone around here would know that. GaryM, how is it that Eisenhower-supporting conservative scientists like John von Neumann could see AGW coming as long-ago as 1955? How is it that progressives award small-farmer/Christian Wendell Berry the nation’s prestigious Jefferson Award? How is it that conservative Christian organizations around the world reject the mindless nihilism of denialism? Why are so many Christians on-board with James Hansen’s gospel of sustainment? Where is denialism’s message of faith and science and enterprise and hope? For the same reason so many progressives took part in the various technologically enhanced genocides of the last 10 years. People are capable of great evil, and great stupidity. One is often confused with the other. They are not synonymous, but they are not mutually exclusive either. fan’s typical scatterbrained comment does bring to mind an actual point though. Can you name a government founded and run on conservative principles that committed genocide? Ever. Conservative here is used in the sense I use it (and the dictionaries too). An ideology founded on free market capitalism, representative democracy, and the Judeo-Christian ethic. It is a pleasure to help increase your Biblical knowledge, GaryM! Of course, modern-day Christians have evolved a more nuanced appreciation of the Creator’s plan, isn’t that right GaryM? OK so you’re depressed. Can you explain how she is helping to sustain the consensus? Without exaggerations of contrary science she regularly pokes holes in the consensus. You want a movie like Al Gores (maybe called “Uncertain T. Monster and the Poison Chalice”) full of exaggerations and irrelevancies? FWIW (one always says this knowing that it might be worth nothing) I prefer Prof Curry’s approach. Thanks for the help. Now if only you had actually read the question you copied and pasted. Not to mention, Biblical Israel was not a democratic republic nor a free market economic system. GaryM, do you really mean to say that Jehovah used to order genocide routinely, but nowadays He has mellowed? How exactly does Jehovah go about changing His mind in these matters? GaryM, do you really think that Christianity has ceased to evolve? GaryM, do you really imagine that left-wingers, right-wingers, and religious fanatics have not *all* of them embraced systematic torture and murder in service of ideology? Your reasoning processes are mysterious GaryM! I don’t have the time, or the interest frankly, to cut through the gordian knot that is your scrambled, revisionist progressive view of history. I will just say that fascist governments like Argentina in the 1950s are not, despite your desperate need to believe so, conservative governments. Military coups do not fall under most people’s definition of democratic republican forms of government. Nor was it a free market economy. From your beloved Wikipedia (the progressives’ online encyclopedia): “Peronism is widely regarded as a form of corporate socialism, or “right-wing socialism”. You really need to try to progress from this “angry toddler beating his fists against mama” phase. Dr Curry is not your mama, and she can do whatever she damn well pleases. Given your apparent views, she is hardly top of the list of enemies. Or are you one of those bitter ideologues who hates deviationists more than the opposition? If you have any guts, demonstrate it by attacking your real opponents, rather than crying at mama’s skirts. “unequivocal” and “unprecedented” — what they really want to say is “infallible”. So we have to offer up scary scenarios, make simplified, dramatic statements, and make little mention of any doubts we might have. Each of us has to decide what the right balance is between being effective and being honest. “The 97%” decided that being effective was more important than being honest. The IPPC are undertaking a political project. Climate change is just the vehicle. As stated by their official, Ottmar Edenhofer in 2010, the purpose of the project is to distribute wealth and resources from the richer countries to the developing ones. The UN tried to grab the power to raise climate change taxes on a compulsory basis acting as a world government “in order to save the planet” but really to fund their redistribution project, but some national governments blocked this. The project continues. The noble cause aspect of it seems to make lying and cheating quite acceptable. It certainly seems to sit well with some of our scientists and institutions. Agenda 21 will absorb the IPCC mission and it will have an even more doctrine “science” industry backing it. “Sustainability” is a sure money bet since it doesn’t depend on spaghetti charts as a rationalization. “Save the Earth” but no temperature stats next time. They have to be wondering what they were thinking. You have that right. However I suspect they will run into the problem of most people not caring about any of the Agenda 21 goals or sustainability. At least not when it means money out of their pocket. That was the beauty of global warming / climate change / extreme weather / etc. It came with a large set of scary stories. What is Agenda 21 going to scare us with? Runaway population growth? The data is pointing the other way. Mass starvation? Caused by what if not extreme weather and a disasterous change in climate. Resource depletion? That has always been a non-starter. n a Nov. 17, 2011 report, “International Climate Change Assessments: Federal Agencies Should Improve Reporting and Oversight of U.S. Funding,” the GAO found that the State Department provided $19 million for administrative and other expenses, while the United States Global Change Research Program (USGCRP) provided $12.1 million in technical support through the U.S. National Science Foundation (NSF), averaging an annual $3.1 million to the IPCC over 10 years — $31.1 million so far. US taxpayers pay almost half. I wonder how many will read what they payed for. Nice catch. US paying half means half can be defunded as soon as grown ups get elected to Washington. Proving that the SPM is politics, not a scientific summary for policymakers. And digging into AR5 WG1 “final” draft compared to leaked SOD shows how unscientific even that is. Comparisons of chapter 7 on positive cloud feedback are quite revealing. The SOD admitted lack of knowledge and model impossibility but maintained high confidence anyway; the “final” draft released got rid of the lack of knowledge, did not admit GCM grid scale impossibility, added non-GCM methods to claim clouds were were reasonably modeled (ignoring the fact this is not true for CMIP5), and remained highly confident. Now why would Saudi Arabia want this added? Why would that be to their interest? Oh yeah, if the human carbon volcano shuts down, all they have left is sand. And plenty of sunlight. And seashore. And sand is mostly silicon. What they really lack is imagination. They also do have the occassional beheading. Stop picking on the religion of peace. They might send a suicide commenter into the blog. That’s not funny Gary and is rather insulting to those who might be Saudi. You should be ashamed. If your comment to Gary was meant as kidding, it didn’t come off that way. If you were serious, you need to get a grip, as it was no more insulting than your own beheading comment. Besides, who placed you in charge of protecting Saudi’s from being insulted. Or even determining what might insult a Saudi? Gates’ comment was either tongue in cheek, or foot in mouth. My bet is on the latter. By that same token we know why the scientists want to keep the public from knowing about the pause: Oh yeah, if human carbon volcano doesn’t matter, we don’t need to employ all these scientists to write about what’s not going to happen, all they have left is to go out and do real work. But thanks for indicating that the SPM is actually political in nature. If you can just get to the point that Rule 10 of the IPCC is try to ensure that the “science” matches what they want in the SPM, I can note that you are even-handed. A claim is being made that 1.7C is the same as 2.0C. Remember the Nuccitelli and Mann’s “How The Economist got it wrong”? Really? Is that really you, JFP? RGtSW thinks that because Saudi Arabia is an easy target is an explanation about motive in a discussion that is supposedly a summary of science. The Saudi’s could not possibly have a real point because they are a vested interest. The correct point is that all have vested interests because this is a failure of the commons. Seems to escape from people’s perception all the time. and what will we be left with without oil and gas? It is interesting that out of all the vested interests working away here, you comment only on that one. what will we be left with without oil and gas? Sunlight, silicon, and sea water. They better build some good solar installations while they got the money. They are well suited for solar, sitting on all that oil. B. its potentially important just as the UNDERESTIMATION OF ICE LOSS is important. C. Its in their financial interest. The presence of interest tells you nothing important. In order of importance to Saudi Arabia: C, then A. B proabably doesn’t interest them too much. Not much ice in Saudi Arabia except in drinks. While Saudi does have a vested interest, they can’t really be worried by the IPCC process. There is currently no credible alternative to burning hydrocarbons for transportation, or even–although the problem is far more tractable–for utility scale energy supply. Unless there is a technological breakthrough humanity will combust the vast majority of the earths extractable hydrocarbon reserves. The carbon mitigation brigade’s effects on this will be barely measurable, and opinions to the contrary are merely wishful thinking. Unless there is a technological breakthrough humanity will combust the vast majority of the earths extractable hydrocarbon reserves. There speaks total ignorance. Solar PV is on an exponential price decline, and hydrogen storage technology will be mature enough to render fossil fuels obsolete long before they’re all burned. And that’s assuming hydrogen-based biomethane, or other bio-fuels from direct “burning” of hydrogen in CO2, doesn’t happen. AFAIK no special “breakthrough” will be necessary for that. AK, think you missed the point somewhat: I meant that it’s technological breakthrough’s that will stop us burning hydrocarbons rather than political/social factors/agreements/movements. Solar PV may well end up being ubiquitous, cracking water to store hydrogen that is then used in fuel cells (or similar)? But the breakthroughs have not happened yet. The clue is in the lack of mass adoption or the use of subsidies to encourage early adoption. Saying otherwise is plain delusional. So until those breakthroughs occur we will continue to burn through our hydrocarbon reserves, just like I said. I got your point, but you’re wrong. A “breakthrough” involves a change in scientific theory. Maybe a small change, but something that current theory says if “impossible”. An example would be materials strong enough to support a space elevator (with a caveat involving exponential decreases in cross-section from square kilometers to millimeters). No such “breakthrough” is necessary for solar PV. Just the continuing decrease in cost/price that has been going on for decades. Silica (sand) can be converted to silicon through electrolysis. Silicon can be zone-refined to necessary purity. The actual cooking and doping process has been decreasing in price at a good clip. People claiming that Moore’s “Law” can’t be applied to PV are mistaken: IBM recently announced technology to achieve concentrations of 1-2000 times, at which point the actual cost of the silicon is tiny compared to the support structures. Inverters aren’t necessary with electrolysis, cheap catalysts are already being produced on the lab benches, cheap concentrating systems are simply a matter of putting the right design teams to work. IT, necessary for active control of sun-following technology, does come under Moore’s “Law”. Cheap catalysts for fuel cells are on the lab benches, although they aren’t in production. But the breakthroughs have not happened yet. The clue is in the lack of mass adoption or the use of subsidies to encourage early adoption. “Breakthroughs” aren’t necessary. The simple process of R&D has already solved most of the problems, it’s just a matter of engineering and adoption. Give it a decade or so. […] humanity will combust the vast majority of the earths extractable hydrocarbon reserves. Anytime billions of dollars and fossils fuels are involved the Saudi’s will be “worried”. They know the potential decisions by policymakers related to IPCC findings can affect them. As it stands, AR5 won’t hurt them much as it won’t move the political policy football too much at all. Anytime trillions of dollars and lack of fossil fuels are involved, the ROW should be worried. Craig Ladenesque fantasy economics to save the world from overestimated threats are not the proper course in such a case. made my day, thank you one and all armchair pundits! Clearly, you are willing to permit the IPCC to change its graphic presentations of the divergence between model projections and data while offering no account of the change. So, why should interested parties, such as some commenters at this site, bother to read or discuss graphic presentations from the IPCC? Do you hold the IPCC to some standards that cover its published graphic presentations? It seems to me that you do not. The text of report is written by the authors, the figures are also defined by them. The report is based on published science, but it’s not produced using a copying machine and scissors. All that can be done properly and improperly, I’m for the proper choice. A non-answer reminiscent of the IPCC’s non-answers. Pekka stakes out his plot on the deserted island, his ‘proper choice’. The IPCC squats officiously in the utopic megalopolis of improper choices. How brave of Pekka to scorn all that and make the lonely, brave, choice, the proper one. As usual you are measured an insightful. This fight will need more of the later in the future. You get some idea of the political objectives in this 2010 interview with the co-chair of working group III. If statements like this continue, Judith may think that the true-unbelievers will no longer accept a “lukewarm” leader…nothing but complete unbelief…the Uncertainty Monster must become the Unbelief Monster. Twenty years of only talking among themselves, congratulating each other on how clever they are, and avoiding any external discussion have left them weak and flabby..lacking ‘match fitness’. And it seems that some genuinely believe that dissenting voices can only be from knuckle-dragging idiots beholden only to their next payment from a BigOilDenierConspiracy. I’ve always been struck by the lack of correlation between IQ points and good ‘ol, common sense and street smarts. The IPCC is a masterpiece of group idiocy. But we can’t forget what their primary function is, which is essentially to keep the CAGW wheels greased. They could not do this while putting out what could be considered, a fair and reasoned analysis. Much of their idiocy, or what appears to be idiocy, is intentional I’m sure. A legitimate genius, but a complete disaster at mastering the mundane details and personal interactions involved in the practice of law. One of the nicest guys I have met as well, but I wouldn’t have let him do a simple real estate closing for me. He ended up much happier in journalism, where common sense is not a prerequisite. Took the words right out of my mouth, Latimer. The IPCC is acting with the same arrogance that one expects from a professor who is arrogant and tenured. The professor can always hide behind the idea that he is addressing only other professors and that they can be expected to understand his shenanigans. The IPCC does not have the protection of tenure or the university system. Their audience includes all taxpayers in all countries. If they are not going to address their audience then they should expect some US congressperson to introduce a bill that defunds the IPCC. Yes you are the only one Latimer Alder. Nowadays most folks think of Randian libertarians as the folks yer talkin` about! It is a pleasure to answer your questions Latimer Alder! Doubtless many good candidates for public office have taken a hit at the polls over the years for standing up to the superstition and ignorance of global warming, which is nothing more than a hoax and a scare tactic that the Left found to be useful to stampede the herd. You can bet the political opponents of those earnest and principled skeptics are now using their positions in the Congress and the Senate to bring down Americanism to bring about their liberal Utopia. Global warming is like sciatica–e.g., neither is not a problem; rather they are symptoms caused by underlying problems that must be addressed. The first step in finding relief from the insanity of global warming alarmism is to recognize that global warming has nothing to do with science. It’s all political. It’s all dogma. WD-40 is anecdotally useful, and safe and cheap. Get it now before the runaway global inflation. “Sceptics” generally hold the view that things work rationally, and,as such, they are winning the debate. Actually the game is played by different rules. Things have got way beyond science. The next step will possibly be the deliberate and official falsification of data. Ie way beyond the “massaging” seen to date. True, true, Illinois politics and Copenhagen science. Is your refrigerator running Prince Albert’s snuff can up its nose? IPCC could do politics for as long as the politicians want it. It is after all a good distraction from the problems of the global economy. Advanced “western” economies need AGW to stop China and India from growing by using coal for energy. Making China and India purchase expensive nuclear technology from the USA or Europe would be a good way to shift the balance of trade problem. The only problem at present is that making electricity more expensive hurts western manufacturing and consumers. At the end of the day, real science will prevail and the fallacy of CO2-induced warming will one day be properly exposed by real laboratory experiments probably performed by physicists. I would love to agree with you, Latimer, but I fear you are wrong. The IPCC is writing to it’s audience; namely all the learned scientific societies, headed by the RS, and the APS. These organizations are getting EXACTLY what they want; namely an excuse not to have to change their minds, and so lose funding. Until we deniers have an institute comparable with the RS in our corner, all these words on blogs will be just that. Words and no actions. And how do you get a scientific society in your corner? I think it is easy, just change corners. No, Bob, my integrity will not allow me to change corners. And I have no idea how to get any organization Into the skeptic corner. Real honest skeptics don’t take sides or corners, but only accept the most currently likely as their provisional truth. Corners are for true-believers and true-unbelievers, firm in their convictions. As long as the CAGW premise (as outlined by IPCC in its AR4 report and reiterated in AR5) is still “politically correct”, there will not be any major scientific body that shows any skepticism of this premise. This is tied to the funding issue, as you write, Jim, but I believe it goes further than that. CAGW has become a multi-billion dollar taxpayer-funded big business and there are still some, who hope it will become a trillion dollar business with the enactment of a direct or indirect global carbon tax. A collusion of powerful interests involving all sorts of different groups and individuals are hoping to gain wealth, power, prestige, etc. by getting a slice of the pie. CAGW is also the current scientific paradigm. Nobody says it, but it is generally understood that “the science is settled”. It will take a major paradigm shift for this to change. While there are many scientists who already have expressed skepticism of the CAGW paradigm, it will take a major “happening” for a real paradigm shift to occur. b) if the work at CERN, for example, corroborates not only the cosmic ray / cloud mechanism, but also demonstrates in a reproducible experiment under conditions simulating our atmosphere that the mechanism can produce significant warming of our climate. And either of these will take some more time. Scepticism for me means more than just doubt, it means a willingness to consider all evidence. Many of the champions of the pause refuse to consider the uncertainty of short terms estimates of climatic trends. If anyone can show trends that exclude a warming trend of 0.1 C per decade, I am will to call a pause. The trend in global temperatures will still vary about the average with whatever oscillations that can be tracked. Most them seem to compare only two points on the earth. It’s going to take more than 5 more years of flat temperatures to reach a statistically significant pause, more like 10. If that happens, without significant volcanic eruptions, a seriously quiet sun, nuclear warfare or anything else known to cause cooling, scientists will have to look at a lot more than just the anthropogenic global warming theory. A lot of other science would be on shaky ground. Because it is basic application of fundamental science that has been found to be robust. If you think it could be cosmic rays, a little investment in time or money may divest you of that. You could buy equipment to measure the applicable parameters or read some textbooks on radiation or study laboratory clean air standards. The problem with cosmic rays is too many dust particles and not enough cosmic rays. No matter what they find out about it at CERN. When that gets done, someone will just fund another anything but CO2 project and Max will say lets wait until this new theory is tested. Cosmic rays have about as much effect on climate as Bill Gates salary on the gross domestic product. The CERN Cloud experiment was initiated by Kirkby who is an specialist in detectors and in doing experiments at accelerators. I would, however, think that the most important contribution to the work will be provided by the aerosol physicists whose specialty is better suited for interpreting the results. I wouldn’t expect anything dramatic from the experiment. The aerosol physicists are happy to have the opportunity to study droplet formation with the tools CERN can provide. That may lead to progress in understanding, but very unlikely to conclusions that support a strong role for cosmic rays in climatic variability. That we have not had any new publications since 2011 is not particularly promising even for major new insight in aerosol physics. How about 12 years of slight global cooling, despite unabated human GHG emissions and CO2 concentrations reaching record levels? Seems to me to be pretty strong evidence that CO2 is NOT the “climate control knob” as touted by IPCC. Agree that the CERN CLOUD experiment still has a lot of work to do before the cloud nucleation mechanism, which was corroborated by the previous work in the presence of certain naturally occurring aerosols, can be either validated and quantified or falsified as a significant climate forcing factor (under controlled conditions simulating our atmosphere). As they say, “much work remains to be done”. But don’t “write it off” before the work is completed. That would be “denial” rather than simply “rational skepticism”. Heh, ‘aerosol physicists’ are busy reflecting on what is reflecting and what isn’t reflecting. How about we wait until GISS, NOAA, HADCRUT4, RSS and UAH are all unanimous on the slight cooling crap. Right now it’s only 3 of 5 with again 3 of 5 failing to exclude the positive trend of 0.2 C per decade, hell, UAH fails to exclude 0.3 C per decade. Those are 12 year trends as Max specified, I can’t keep track on how long the supposed pause is because non of the so called skeptics will define it. What is missing from the IPCC AR5 WG1 Summary for Policy Makers is a simple and direct statement acknowledging that the basic facts and physics of global warming are in fact clear, compelling, and well understood. While the IPCC Report is a comprehensive summary of our current understanding of global climate change, it does also have a political component – hence the need to make the overly-cautious and conservative statement (to placate the skeptic/denier elements in some participating countries) that the human induced contribution to the observed global warming is only at the level of being ‘extremely likely’ with 95% confidence. If we go on pretending to be ignorant of the physics involved, and attempt to attribute the causes of the global temperature increase by statistical means only, then of course there will be significant statistical uncertainty in making such attributions. This is because the observed temperature record is short relative to the magnitude of the natural variability of the climate system, and also because there are a number of minor climate forcing contributors that are not fully defined. Despite the complexity of the climate system, the basic aspects of our changing climate are straightforward and understandable. There is the natural variability of the climate system that exhibits interannual fluctuations in global temperature such as El Ninos, La Ninas, and longer period decadal oscillations. In the absence of changes in external radiative forcing, these are random looking fluctuations will oscillate about a zero reference point – after all, global energy has to be conserved. This natural variability of the climate system affects past, present, and future climate. While this natural variability of the climate system continues to be poorly understood, it is not a driver of the long-term climate trend. 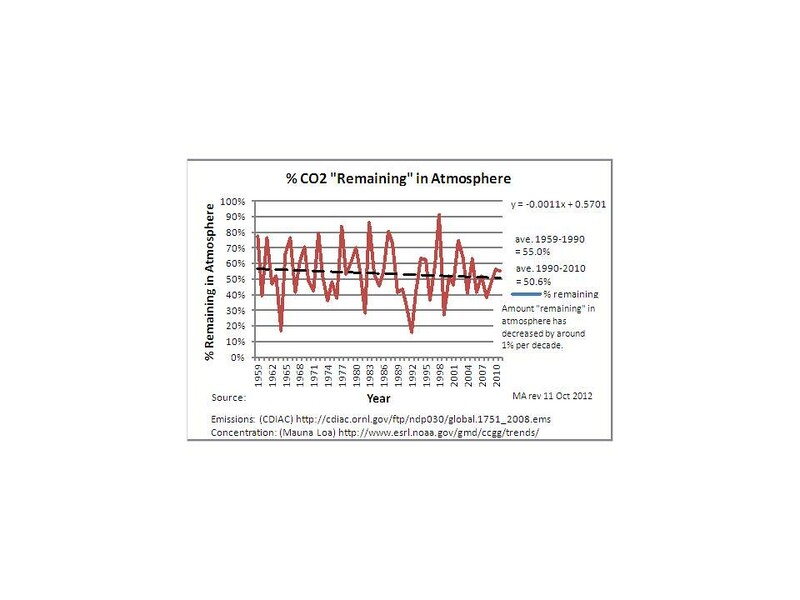 What has been accurately measured and monitored is the growing increase in atmospheric CO2 and other greenhouse gases (e.g., CH4, N2O, CFCs). It is the increase in these non-condensing greenhouse gases that is the immediate cause and the source of the long-term problem of human impact on global climate change. These non-condensing greenhouse gases are chemically slow reacting. But once injected into the atmosphere, they remain there for decades, and much longer. They cause the inexorable increase in the strength of the greenhouse effect, which is magnified further by the positive water vapor feedback effect. This aspect of climate physics is also a matter of global conservation of energy. There is no other option for global climate but to warm in response to the increase in the non-condensing greenhouse gases. That is all well established classical radiative transfer physics. Of the non-condensing greenhouse gases, CO2 is by far the strongest. Hence, it is atmospheric CO2 that is the principal control knob that governs long-term climate change on Earth. If humans really want to maintain the terrestrial climate in its current climate state, and wish to avoid the impending and inevitable rise in sea level, they had better learn to be in control of the level of atmospheric CO2. At a minimum, the IPCC SPM should reflect these basic facts of physics. So what is the net impact of water vapor on global temperature? What is the net impact of clouds on global temperature? Why have reported global average surface temps not risen significantly in the last 15 years although CO2 emissions have continued unabated? Why are the GCMs incapable of accurately predicting temperatures? Why haven’t upper troposphere temps increased at the level predicted by AGW theory and computer models? How has the heat that has allegedly relocated in the deep ocean been transported there? Just simple, direct statements setting forth the clear, compelling and well understood answers, please. You are confusing yourself by going off in too many directions at once. Try thinking about one issue at a time. But for starters, water vapor does have a very significant impact on global temperature change, being that the radiative effects of water vapor (and cloud) feedback multiply the radiative effect of the non-condensing greenhouse gases by a factor of three. I appreciate the response, but I’m not confused at all. Nor was I going off on tangents. The list of questions were really rhetorical, delimiting a number of areas where consensus scientists themselves have admitted ignorance. Let me state it in the affirmative. Your statement that “the basic facts and physics of global warming are in fact clear, compelling, and well understood” is contradicted by the admissions of many of your colleagues that scientists do not know: the net impact of water vapor on global temperature; the net impact of clouds on global temperature; why have reported global average surface temps not risen significantly in the last 15 years although CO2 emissions have continued unabated; why the GCMs are incapable of accurately predicting temperatures; why upper troposphere temps haven’t increased at the level predicted by AGW theory and computer models; or how has the heat that has allegedly relocated in the deep ocean been transported there. Which confirms what I have read elsewhere that climate scientists not only don’t know the net effect of water vapor, but whether that net is positive of negative. It was a trial lawyer move by GaryM. Demand a Yes or No answer. We scientists don’t fall for that junk. GaryM, Don’t you mean to say that the “water vapor feedback” might be negative on account of the cloud feedback being very strongly negative, and it being included in the “water vapor” feedback? The water vapor feedback and cloud feedback are usually defined separately. I don’t know any researcher of any repute (and indeed no researcher at all) who believes the water vapor feedback to be negative. That seems to fly in the face of basic radiative and atmospheric physics, as well as a huge range of ordinary observation. It also seems quite unlikely that the cloud feedback would be so strongly negative as to cancel the water vapor feedback. Accounting for the ice ages and the 20th century warming would be difficult with a climate sensitivity below 1°C/(3.7W/m^2). The Milanlovitch forcing just isn’t strong enough to account for the 4°C or 5°C temperature difference between glacial and inter-glacial periods. Mr. Pierre Normand. If clouds haven’t got a negative feedback,then … Which is the major factor that makes the atmosphere to stop warming in a definite point? an only positive feedback would transport our atmosphere to a Venusian one, absolutly charged in H2O. Pierre, the recitation of the catechism, see A Lacis @ 10:47 still combines water vapour and cloud feedback. So you and he wabble about Gary’s first two questions and ignore the last four. Not a very impressive performance. Popoff, there always is an implicit negative feedback which is the Plank response. When the forcing changes, this causes a temporary radiative imbalance at the top of the atmosphere. This energy imbalance then causes the Earth surface and troposphere to eventually warm (or cool, depending on the sign of the forcing change) until the radiative balance at the top of the atmosphere is restored. This is called the Plank response. Were it only for the Plank response, the climate sensitivity to some change in forcing would be about 1°C/(3.7W/m^2). The other feedbacks, such as the water vapor feedback, the snow/ice albedo feedback, the clouds feedback, etc., either increase of decrease this ratio by some finite amount. All the known climate feedbacks on Earth are bounded, so there is no risk of a runaway condition like there is on Venus. Do I have a duty to answer each and every question asked here that aren’t even addressed to me? Notice how flexible water is in that feedback formula? The phase changes, the albedo changes, the distribution changes, there is a lot of variability in the responses of the climate to the various manifestations of water. i would guess that the primary problem which causes the models to diverge from observations is in the exaggeration of the feedback of water, in total. This was obvious years ago, and yet we still have the sort of climate scientist, flooding government payrolls, like Lacis who wants to belabour the radiative effect and ignore the rest of the science. Heh, I have no idea what your duty is, Pierre, but I salute it. I repeat, you and Andrew have waffled around the fact that water feedback is exaggerated in the consensus view, and have not addressed Gary’s even more important questions. As they say, ‘I’m impressed…..unfavorably’. I guess that must be what makes the Gish Gallop strategy effective. One burdens the other party with some time consuming homework. Not only must the other party answer *all* questions, but she also must do so all at once. Else, any answer to some sample among the list of questions is construed mere “waffle”, manifesting a desire to avoid the other “really tough” questions. lil kim, the tiniest of the wrappers. Sounds like a pretty long ramble to me, even if there is a “golden thread” holding it all together, namely that “the science is settled”. You have no duty to answer anything from anyone. They were rhetorical questions because I know none of you can answer them. And you did not disappoint. You didn’t answer the two you did address, you just waffled. The net effect of water vapor is not known. The net effect of clouds is not known. Neither can be accurately modeled. Your evasion just confirmed again my point that Lacis’ statement – that “the basic facts and physics of global warming are in fact clear, compelling, and well understood” – is simply not true. Thanks but no thanks for the waffles. I prefer to get mine from the pancake house. You can get a marvelous odorous array of bright syrups, too, instead of the vinegar bend and snake oil the alarmists shake over your heads. Which is the major factor that makes the atmosphere to stop warming in a definite point? When polar oceans get warm and wet, cloud and ice albedo stops the warming every time. The “science is NOT settled” on the “CO2 climate control knob” hypothesis. This includes (but is not limited to) the long-term effect of water vapor and clouds, both of which are uncertain. They did not include (as you suggest) a specific statement that “the science is settled”. Just because some things might be uncertain, or they might appear difficult to understand, it doesn’t mean that everything is hopelessly uncertain. I criticized IPCC AR4 (didn’t participate in AR5) for not paying more attention to the physics that is very strongly robust. Yes, such a shame that AR5 ignores settled science, and obscures unsettled science. I’m 95% sure they are getting somewhere. It is true that global temperatures must rise as we add more CO2 to the atmosphere. The problem is we cannot measure how big this rise is, since we cannot do controlled experiments on the earth’s atmosphere. No-one has measure a CO2 signal in any modern temperature/time graph, and this strongly indicates that the CS of CO2 is indistinguishable from zero. When you have some clue as to how to measure a CO2 signal, then maybe you will see something different from zero? Ah, Jim, he suggests he’s measured it. Dare we ask him for a number? A. Lacis still stuck with blindered view of natural variability. Neglect the millennial at your perennial. Hopefully you understand that natural variability is a fact. So is global warming. Natural variability cools and warms. What’s it doing now? Andy what is missing is the quantification of the temporal response in fast /slow systems . Hansen ( 2008) found that the fast feed back response to a 3 c doubling was around a millennium or around 2^40 generations of his prodigy. It is actually more productive to try quantifying the equilibrium climate system response, rather than get yourself confused by trying to understand transient fluctuations. Quantify the never will be, rather than measure the here and now. Appell gets a Gold Star. Fur flies at all these frays. Judy, working on climate research has been a more pressing and challenging task. But as you know, there have been too many crazy-clueless Congressional Republicans who have totally lost touch with rational reality. I do hope to be getting back to doing climate research before too long. You know Andy I’ve found, via experimentation, that if you insult people its very hard to convince them. Ask around, Ive insulted many people. If you think they have lost touch with reality, do you suggest medication? or institutionalizing them? If you were just using hyperbole, then, I’d suggest that they are justified in questioning what you say, not disbelieving what you say, but definately questioning it. If I recall correctly, it seems to me that it was the “crazy-clueless Congressional Republicans” who called Dr. Curry to testify regarding uncertainty in climate science. While the open minded, reasonable, right thinking Democrats didn’t want to hear about any dissenting views. I wonder if more of the US government scientists will take to the blogs during their furloughs, like Andy Lacis apparently has. Steven, I try not to engage in gratuitous insults without there being some objective basis for the picturesque language and hyperbole that comes within range of appropriate. I would of course much prefer that we all should actively strive to always be calm, collected, and rational. Unfortunately, that seldom seems to happen in the real world. Perhaps you have some pointers for Congressional Republicans that would serve to enhance the respectability that they all presumably aspire to. Most of the Congressional Republicans believe in AGW. Most of them used to believe in CAGW, but no longer do. Once you understand that distinction, A. Lacis, you will be less clueless. Andy’s CO2 climate control knob just dropped off in his hand. Can’t argue with any of that and Lacis’ note should actually be a starting point for motivating those of us interested in understanding the climate and its role in shaping our future. I find that part of your comment truly interesting. It suggests that you would support an even higher confidence level. I am interested in how you would calculate that confidence level. The IPCC does not provide any details on how it calculated this statistical confidence level so that from an outside looking in appearance it seems quite arbitrary. Has this confidence level been determined statistically or not? I also find it interesting, almost laughable, that you believe the confidence level of ‘only’ 95%’ was made to placate the skeptical/denier element of some participating countries. This suggests to me that the confidence level of 95% really is an arbitrarily derived number. How many statistically derived confidence levels consider the feelings of skeptical/denier elements in some participating countries? Scientifically, this would not make much sense…. would it? So, again, how would you calculate the confidence level to be greater than 95% vs how the IPCC determined 95%? Your answer would be very enlightening to us all as you are a respected physists studying the climate on our behalf. An interesting way to put it. The IPCC can’t calculate confidence intervals. That would be research. They don’t do research. They just summarize. And apply squishy faux numbers. A transient sensitivity of 2 C per doubling, which is supported by the physics arguments, provides a warming of 0.7 C since 1950, which is more than the observed 0.5 C. When you are left looking for negative influences like aerosols to explain the observed warming, it gives you confidence that CO2 alone can account for all the warming. Most of the scientists are in this boat, looking for why it hasn’t warmed more rather than why it has warmed so much. I tend to agree with your comment – what with me being a skeptical person in general and all. But that’s just a general reaction, not something specific and certainly not on based on a scientific analysis. You obviously think that higher than 95% confidence is not scientifically indicated (in fact, laughable). Do you have a scientific basis on which you have reached your own confidence level -which is, obviously, 95% or less? Assuming it to be less, how much less is it? Of course, you are not a renowned physicist studying the climate (well, at least I don’t think that you are). I wouldn’t expect the bar to be as high for you. But I do think that if Andy is not reaching his confidence level as a direct numerical outcome of calculations – it is likely derived from a deep theoretical understanding of the related physics (with a caveat, of course, that he like all of us needs to control for influences such as confirmation bias) . Jim D, the question is how one calculates a confidence level of 95%. Is this not a statistically derived number? If so, how was it determined and why is it not described in AR5. How are we to understand how the confidence level increased from 90% to 95% between AR4 and AR5 when we don’t know how either we’re derived. How are we to know this is an accurate assessment of the confidence? The 5% is taken to mean that there is a 5% chance CO2 doesn’t account for more than half the 0.5 C warming, that is less than 0.25 C. Even the most ardent denialists would probably concede 0.25 C because that is less than the no-feedback response. Not only that, but then they have to explain the rest of the warming by an unrelated effect that they haven’t come up with yet. 5% is generous for this idea. Joshua, i think you misunderstand what i meant by ‘laughable’. What I find ‘laughable’ is the notion that the 95% confidence level was partly determined by the feelings of skeptic/denier elements in some participating countries. How do you statistically incorporate reasons to ‘placate’ those elements in a statistically derived confidence level? Coming from someone with the clout Andy wields in the climate modeling community as well as the overall climate science community and by one who probably knows the inner workings of WG1, this is a rather enlightening comment with respect to how the 95% confidence was determined. Evidently there is a component to placate skeptical/denier elements considered in that calculation…. No? I’m asking Andy how this is done because I have no idea how one goes about doing that. Jim D, as stated, your idea is not wrong. But we are talking about a confidence level, which is a statistically derived number. Your handwaving does not show how it was derived. What we know about sensitivity has not really changed from AR4 to AR5, except for including a lower range, which in my mind does not appear to add confidence. How do we go from 90% confident to 95% confident? How do you determine that 5% is ‘generous’. Again, we are talking about statistical levels of confidence which are not derived arbitrarily, they are calculated numerically. What number from what sets of data statistically show that we can express our confidence at 95% and likewise what changed from AR4 that improved the confidence from 90% to 95%. Numbers please, not handwaving. So it seems that like many “skeptics,” Andy thinks that a statistically derived confidence level should be different than the 95% offered by the IPCC. Kind of ironic, actually, how he and they are in agreement. Reminds me of how both sides are absolutely convinced that “the MSM” is responsible for their views not being more universally accepted. Funny how smart people can be absolutely confident about completely contradictory conclusions (even more so when they don’t have validated substantiating evidence). I will say that if members of the IPCC think that lowering the confidence level to 95% would in any way placate “skeptics,” they’re not paying close attention. In fact, almost nothing the IPCC could ever do would be met with acceptance from “skeptics.” It is amusing to me to read “skeptics” saying that the IPCC “missed an opportunity,” after they have routinely trashed the organization as being completely corrupted and fraudulent. My guess is that nothing short of a report repeating over and over “Anthony Watts is our daddy” would work, and it certainly should be obvious that 95% certainty wouldn’t get the job done. So yeah, maybe if Andy’s speculation is correct, then it would be laughable if they actually thought that such a move would be effective. Well Joshua, that is an interesting twist to what Andy said. But like JC, I am just interested in how the level was mathematically determined since it is a statistical expression. Maybe I’m a dunce here on this topic and just don’t get it. That’s why I want Andy to explain. I avoid working with statistics whenever possible. There are too many imprecise ways to perform statistical analyses – particularly when there is incomplete knowledge as to all relevant variables, their possible interactions with each other, sampling issues, and data quality in general. Sometimes there is no other option but to rely on statistical analysis. But when there is an option to work the problem directly from basic physics – that is the option that I prefer. Conservation of energy is of course the starting point. Since the global energy balance is strictly radiative, it is directly amenable to radiative transfer modeling analysis. Absorption cross-sections are available for the principal absorbing gases in the atmosphere. Radiative transfer theory is well understood. Computing resources are available to do rigorous line-by-line calculations. The atmospheric distribution of the non-condensing radiative forcing greenhouse gases is accurately known. Those are the basic ingredients that are needed to perform rigorous calculations of the atmospheric greenhouse effect, which is the key factor needed to understand the nature of global warming. So, I don’t worry that much about the statistical analysis that people do. Looking at the basic physics involved leads to much better understanding in how to interpret the observed changes in the global climate system. > I am just interested in how the level was mathematically determined since it is a statistical expression. you do not get, John? John Carpenter, you can start with the transient sensitivity and see how far on the low-end tail you have to go for CO2 to only provide 0.25 C with a 30% increase in concentration. It turns out to be outside the 95% range of even the Otto sensitivity range, which is one of the lowest estimates published. Thanks Andy, I appreciate the response. However my question remains unanswered. I shall look elsewhere. BTW, I don’t have any issues with the physics involved in understanding AGW. I feel the work you do is important and valuable to our understanding. But from a policy standpoint, the i’s and t’s have to be dotted and crossed when the IPCC uses statistical terminology to describe confidence. That means showing your work. For the general public to gain confidence in the definitions used by the IPCC, it needs to do this in my opinion. Jim D, thanks for pointing that out. Now why can’t the IPCC show that? I get all of it, Willard. Which part of that mathematically shows how one gets a 95% confidence level? You know you’re asking a rhetorical question, John? Crunch all you want, we’ll make more ™ (r). The evidence is overwhelming and more will arrive as time marches on. Yes, but many times basic physics have been stablished after observation of periodic phenomena (for example sun, moon, planet movements, or Bode´s Law). Al the cyclic, or wavy effects are very difficult to explain with the “basic physics” we usually think , when there are re-alimentations, feedbacks, etc, that cause wave effects. “too basic physics” would say that a river should flow straight forward with an incresing speed, more complicated physics and observations show that the river begins with their cyclic meanders. Why that crazy, clueless climate, not following in lockstep the basic radiative science. We know from empirical data that the average surface temperature is about 0.6 C higher in 2010 than in 1951. Over that same period CO2 c0ncentration has risen from 310 ppm to 390 ppm. log(390/310)/log(2)=0.33. 1) Most ot the warming from 1951 to 2010 is due to increasing CO2 concentration. The climate response (CR) of 2) is likely to be close to the TCR defined by IPCC, the slightly shorter period lowers the value, but the slower annual rate of increase (0.4% rather than 1%) increases it. Put together the effects largely cancel. When the increase of other GHGs is added, the required CR is reduced to perhaps 0.8 C.
Several approaches used to estimate TCR have consistently given lower limits of 0.8 C or more, some of them with 95% certainty. Based on the above the statement of IPCC seems to be technically correct and justified by observational data. In the same way the other part of their statement that the best estimate of GHG based warming is close to the total warming is also correct based on the analyses available. Another question is, whether the particular formulation is appropriate. I don’t like it, but would rather like to see estimates of TCR replacing it as the primary way of telling about the empirically determined strength of GHE. Kim, I’m 100% convinced the climate is following the basic radiative science, in perfect lockstep. Don’t play the shell game here. “95% confidence that ‘most’ of the post-1950 warming was caused by human GHG emissions” is the claim. If “most” is defined as 50+%, you are right. Is that what IPCC meant? If so, I agree. However, I have the sneaky suspicion that IPCC wanted readers (including “poliymakers”) to believe that “most” meant a lot more than that, say “essentially 100%”). And this is obviously absurd. NOBODY can be “95% certain” that “essentially ALL” of the post 1950 warming was caused by AGW. Andy, this is puzzling to me. It would suggest that you would endorse the idea that the difference between 95% and 100%, a mere 5%, would be the difference between overly cautious and conservative and what… Overly reckless and liberal? Really, how would you rate 100% certainty in terms less than ‘overly cautious and conservative’ when your definition starts at 95% confident? You only have 5% to make a distinction, which doesn’t seem like much to me. What would you consider 90% confident? I have a hard time squaring your definition of 95% confidence level with what I would consider it to be a fairly over reaching and not rigorously defined level of confidence. Any comment on that? I have a hard time finding any definition in Andy’s comment. It is very likely that [t]hese non-condensing greenhouse gases are chemically slow reacting. But once injected into the atmosphere, It is very likely that they remain there for decades, and much longer. It is very likely that [t]hey cause the inexorable increase in the strength of the greenhouse effect, which is magnified further by the positive water vapor feedback effect. It is very likely that [t]his aspect of climate physics is also a matter of global conservation of energy. It is very likely that [t]here is no other option for global climate but to warm in response to the increase in the non-condensing greenhouse gases. would be an interesting way to reword radiative physics. Reminds me of the interesting suggestion to add the word “theory of” in front of every occurence of “evolution” in school books. I dunno Willard, Andy says…. He has defined ‘extremely likely’, which is IPCC speak for ‘95% confidence level’ as an ‘overly-cautious and conservative’ statement. How am I wrong there. How is that hard to find? Andy has done no such thing, John. Quit injecting your need to define that 95% number into Andy’s comments and scratch your own itch. Oh, ok Willard, so what has done then? Willard, you do realize the IPCC has defined ‘extremely likely’ as a 95% level of confidence don’t you? > Oh, ok Willard, so what has done then? Andy has made a simple reference to the IPCC definition. Andy described the IPCC definition. Andy’s point seems to be that pussyfooting about definitions about confidence level obfuscate basics facts of physics. And you ask Andy to pussyfoot about definitions of confidence level. I find that very interesting, John. Willard, you appear to be school marming me here. “Andy has made a simple reference to the IPCC definition. Ok, he described the IPCC definition. So sorry. It’s hardly pussyfooting. If you’re going to use statistical terminology to back your facts then be prepared to show your work. I have no problem with the basic facts of the physics, I have a problem with assigning confidence levels with no supporting analysis on how the level was determined. Further, I have a problem with the idea that, in part, the confidence level was apparently determined to ‘placate’ skeptical/denier elements. Any good auditor would be all over this like stink on sh.t. Look, if he is going to describe a 95% confidence level as ‘overly-cautious and conservative’, then I’m interested in how he describes 100% confidence. I find this discussion tedious, Willard. > Look, if he is going to describe a 95% confidence level as ‘overly-cautious and conservative’, then I’m interested in how he describes 100% confidence. The statement is cautious and conservative, not the confidence level. A confidence level isn’t a statement? In Lacis comment, he expressly identifies the confidence level as the statement he considers conservative. I know it’s late (in the US) but sheesh. ‘Snow is white’ is a statement, GaryM. ‘I’m pretty sure that’ is a modality. If you wish to make a less conservative than a statement S, you don’t need to assert S with an higher confidence level or a stronger modality. You can take other statements, like the ones Andy proposed. Curiously, in Spain, many journalists have “bought” that argument of 95%, it sounds mathematical, exact, round, good for titular… but they have no idea of what it means. I have read i.e. some of them understand that 95% of the warming has been caused by humans. 95% of the time I’m sure willard hasn’t led me to greater climate understanding. 5% of the time I’m not sure of the time. Naw, Wee Willie, you got that wrong. Andy wrote (in several paragraphs) that IPCC AR5 was too conservative for political reasons and by using statistical analyses of physical observations of a record that is too short with too many unknowns, rather than by relying on the physical science (which “is settled”). Part of this was that “95% confidence” should be stated more strongly. that the human induced contribution to the observed global warming is only at the level of being ‘extremely likely’ with 95% confidence. He suggests we replace that with a simple and direct statement acknowledging that the basic facts and physics of global warming are in fact clear, compelling, and well understood. It’s tough to miss that suggestion. It’s the first paragraph and it precedes immediately the paragraph about “politics”. Since the A in AGW follows from radiative physics, Andy suggests a simple and direct statement acknowledging basic facts. Not that such claim would prevent anyone like you to play “yes, but misrepresentation” games. This kind of “this” is always interesting. Andy’s not responsible for the IPCC’s glossary. Telling that he defined it is false. It is misleading, as it burdens him with a responsibility he does not have. We have evidence that John knows where to get the glossary. More importantly, Andy’s point is independent from all this pussyfooting, as he suggests we make a stronger TL;DR by talking about basic facts of physics. > If you’re going to use statistical terminology to back your facts then be prepared to show your work. Andy does not suggest we use a statistical terminology. He only considers why it’s being used. Andy and John should at least agree on the idea that making a categorical statement on basic physics may be built a stronger case for the IPCC. Not that this stronger case would prevent anyone from playing “yes, but misrepresentation” or “now that you mention the IPCC, would you kindly throw it under the bus, pretty please with some sugar on it” games. Try listening to Andy Lacis instead, Koldie. I’m here for games like “yes, but misrepresentation” and “now that you mention the IPCC, would you kindly throw it under the bus, pretty please with some sugar on it”. I realize you may have an attention span problem, but when you read a sentence and comment on it, read the whole sentence. Otherwise your comment looks foolish, even if you really aren’t. As for the second part of your comment, it is frankly too stupid for me to waste my time responding to it with any specific comment. Is there a paper of papers or a book you can refer me to about this? I’d like to try and understand that even though I’m not a scientist. Hey, Thanks Fan I appreciate that!! There are too many books and papers on radiative transfer to list. I used Grant Petty’s A First Course in Atmospheric Radiation when I was teaching radiative transfer. I have physics-based paper that will be published in Tellus (probably in a month or two) that explains in detail the radiative transfer that goes into climate modeling and why atmospheric CO2 is the control knob that governs climate change over geological, current, and future time scales. I’ll look for that and look forward to seeing your paper. ordvik, scienceofdoom.com has many many interesting discussions of atmospheric science. Pekka has posted some informative comments there. That is a terrific question, ordvic. Thank you! The American Institute of Physics (IOP) has put together terrific website that works through both the basic science *and* the history of that science. Best wishes for enjoyable reading-and-learning, ordvic! Whatever the attractions of energies exclusively moving back and forth between the oceans and atmosphere – without influencing the total energy budget – it is simply not true. CH4 is 8x more potent than CO2, nitrous oxide is 100x more potent. Don’t confuse potency with activity. I am sure he meant that, taking into account quantity, CO2 has by far the strongest greenhouse effect in the atmosphere of non-condensing gases. Methane hardly accounts for any of the total greenhouse effect. On a per molecule basis in the current climate atmosphere, CH4 and N2O may be stronger contributors than CO2. But both CH4 and N2O have narrowly confined absorption bands near 7-8 microns, while CO2 absorption is spread over a much broader spectral region. Also, the atmospheric lifetime of CH4 and N2O is about a decade, while the effective atmospheric lifetime of CO2 is many centuries. CH4 has been an important greenhouse contributor on geological time scales, but it does not challenge CO2 as being the principal LW climate control knob. “As someone who’s interacted with this niche over the past number of years, my recommendation has consistently been that people who are worried about the impact of increased CO2 need to provide an “engineering quality” exposition of how doubled CO2 leads to (say) 3 degree C and thence to problems. More cerebral, rather than less cerebral”. A Lacis Also, the atmospheric lifetime of CH4 and N2O is about a decade, while the effective atmospheric lifetime of CO2 is many centuries. CH4 has been an important greenhouse contributor on geological time scales, but it does not challenge CO2 as being the principal LW climate control knob. 3 CO2 as being the principal LW climate control knob.atmospheric CO2 is the control knob that governs climate change. Lets forget the role of water vapor then ??? 4 The arguments about CO2 and its effective longevity are specious to say the least, approaching 400 ppm, humans add 3 ppm per year and this is going to stay around for 1000 years? get real The world breaths CO2 inhales and exhales. Forest fires in California and Indonesia ,rotting vegetation on land and more in the sea, volcanoes, etc Say 30 ppm per year and the level only goes up 3 a year. If you are right than 90% of our current atmospheric CO2 is hundreds to a 1000 years old [unused and not recycled]. In fact it all recycles and that 3 ppm rise ?, only 1% is from human activity. angesh, several of your question involve a confusion between residence time and the uptake rate of CO2. The residence time of CO2 molecules in the atmosphere can be short (as indeed it is — about 3.5 years) while the uptake rate by oceans and terrestrial biomass can be much longer. It can indeed be infinitely long, as it is when the ocean partial pressure reaches an equilibrium with the atmospheric pressure as governed by Henry’s law. Under those conditions as many CO2 molecules are dissolved into the ocean as are emitted from the surface into the atmosphere. an “engineering quality” exposition of how doubled CO2 leads to (say) 3 degree C and thence to problems. And that’s not in Andy Lacis’ comment (the “engineering quality” quantification is missing, there’s just the qualitative “happy talk”). That’s the problem here, Mosh (as you know). No doubt what you have written is true concerning the correlation between atmospheric CO2 concentration and its absorption by the biosphere, oceans, etc. The unfortunate fact of the matter is that we do not know where the “missing CO2” is going and why this fraction is slowly increasing over time. Some studies have suggested that increased plant growth has become visible by satellites, but I have seen no quantifying estimates of this. And ocean CO2 measurements are also essentially non-existent. Exactly. Lacis suggests we talk about basic physics and now has to provide an undefined engineer-level derivation. As if we needed an engineer-level derivation to know the A in AGW. Policy with respect to something as complex as climate cannot be proper without a better rationale than a laboratory demonstration of a physical characteristic. Very little more than that has been offered yet, and that is why the policy has been so improper, so far. We need undefined engineer derivations. Heh, the planet’s been put to the stake by voodoo science. The sorcerors still dance wildly, but the crowd’s getting bored, and restless. Why should they dumb it down for you steve? Andy, Welcome back. Your comment says what virtually all climate skeptics believe. As you know, the issue is about the dynamics which result in the feedbacks which are critical for the dire predictions. That is where the interplay between forcings and natural variability might come into play. By the way, we had some discussions of the tropospheric hotspot some time ago here. What do you think of the recent discussion of that topic at Climate Dialogue. It seems to me that the disagreement with models is real and statistically significant as even the IPCC acknowledges in a back handed way by referencing McKitrick 2010. The real issue is using energy balance arguments to understand the basics of climate science. This explains the pause (and pauses) and reduces the variability considerably, so that one can start to understand the implications of a continuing GHG forcing function and the CO2 control knob. Beats me why this approach isn’t pushed more often. The real problem is understanding energy budgets and not merely arguing about it. Andy, do you seriously believe that the big squabble is over basic radiative physics? Of course the squabble shouldn’t be there, but that’s where it originates. CO2 by itself only explains 1.2C of the ECS, and while H2O’s GHG properties are also known, it is hard to pin down exactly how much H2O will outgas with CO2 acting as a kind of thermal catalyst. It could be as much as 1.5C of the ECS, with the lapse rate compensation adding some uncertainty. That leaves about 0.3C remaining to get to the mean ECS of 3C, as other positive feedbacks, such as albedo, and other GHGs that come along for the ride. Those radiative properties are also known, but the mix is hard to get exactly right. That’s where the instrumental and historical studies come in. Everything points to 3C, encompassing both the paleostudies and the current instrumental record. The SPM is not easy reading. That in part due to the way it comes up, but it may be in part also the wish of many participants. It’s now easier to misuse and present own favorite interpretations claiming that they are based on SPM. It could be much more clear on what’s certain, virtually certain, and where the uncertainties are larger. The old approach where the most important conclusions where listed in this order was perhaps better than the present one, where everything is listed in an order based on the subject matter (Chapters B.1 to E.8). It’s still useful to repeat that the basic mechanism and some (even small) human contribution is certain at a level much higher than what’s called virtually certain (i.e. we have a few more nines in 99.9.. %). The estimate extremely likely seems to be appropriate for the warming of 0.3 C since 1951, which is another way of saying most of warming. Choosing a starting date 1951, which makes most certain enough is in some sense a good way of expressing the level of warming, but in some sense also cherry picking that may lead to counter reactions. I have the feeling that exactly that has happened on this site. Then it would also be useful to pick specifically up the hiatus. There are problems from the lack of publications meeting the deadline, but in some way the SPM should be able to discuss the issue, perhaps stating explicitly that the related science is too recent for having been scrutinized fully by the peer community. What disturbs me most are the jumps from something that’s extremely likely or virtually certain to the next step, when the jump is less certain. It’s the same problem we have seen with the percentage of scientists that believe the statement that I described as much more certain than virtually certain. That almost 100% of scientists agree on that is clearly used to imply that they agree on something else, which is so much stronger that a fair fraction don’t do that any more. Here we have the problem that models have been built before latest temperature measurements and also latest estimates of TCR have come out. The projections are based on those models. The models are perhaps not strictly inconsistent with the most recent data, but they surely are on the high side. Therefore the projections based on them are on the high side. My view is that the projections must correspond to the most recent estimates of TCR, not to the set of models we have. How that can be achieved is a problem, but it should be done in some way. In one comment I proposed that the projections should not be based on the GCMs at all but on the estimated range of TCR and some simple energy balance models. These are some views on how the SPM (and in part the whole report) could be different. The problems we have seen and the small change in the overall picture we see from AR4 have lead to the conclusion that the six year interval and the process of writing on AR are at the same time too long and too short. That problem could be solved by switching to a continuous process of reviews and internet based publication depository supplemented by continuously updated assessments of the papers. Another point is than in many cases very likely should lead to the same conclusions as full certainty. When we consider a highly detrimental effect, does it matter, whether it fully certain of “only” 90% certain? In case of really serious consequences even a well justified 5% likelihood should often lead to nearly same action as 100% certainty. But there are also many cases where more quantitative understanding is essential for rational decision making. A 30% likelihood would rationally lead to different action than 60% likelihood, or projected warming of 2 C to different conclusions than projected warming of 4 C. On these issues a systematic quantitatively justified approach in both estimating the parameters like TCR, and in using them in projections is essential. To me it’s obvious that many climate scientists think that the general public would not take seriously enough statements that are maximally objective. What Stephen Schneider wrote tells that he had the same vision. Some recent statements from Germany have told that at least some scientists working presently for ministry also agree. Schneider and the ministry representative tell that being effective may be more important than being objective. I disagree. I remain convinced that that approach will backfire, and I think it has already backfired on several occasions. As an energy economist and systems analyst I want to have the most objective data that can be produced. Risk aversion (or the precautionary principle) must be taken into account once in the final step of decision making. Letting it influence significantly the earlier steps makes the date almost useless for further analysis. Pekka, I’m sorry the IPCC process, dealing politically rather than objectively with the science, led you so far astray. > [T]he IPCC process, dealing politically rather than objectively with the science, led you so far astray. Koldie’s only here for the science, you know. Heh, willard only thinks he’s here, but statistically, there is a much better chance he’s there. In some way it seems that the explanation of the pause is in a “brain storming” phase. Everybody launch their ideas, so, nothing is really well stablished. Exactly, it is a time of multiple hypotheses, which is significant because it implies a basic lack of understanding. Prior pauses occurred before the models were built so there is no data to falsify the built in conjectures of AGW. But this pause is real time. If so, I’d hate to see a “non-neutral” report. I have to agree with Saudi Arabia here.How can you state that warming is unequivocal when it stops and starts since 1850. Yes, GMST rose sharply in two periods:1910 to 1940 and 1970 to 1997, but it also fell 1940 to 1970 and has remained constant since 1997 to 2013. So a total of 57 years of rising temperatures and 45 years of falling or constant temperature. Hardly unequivocal, especially as the world’s scientists cannot agree on the exact cause of either.That is especially true of the influence of the rare gas CO2 whose specific heat is not significantly different from N2 or O2. You should be aware that there is natural variability in the climate system that is superimposed on the global warming trend. There are also episodic volcanoes, 11-year sunspot cycle, and significant changes in atmospheric aerosol loading that can also impact the observed temperature trend. What is of interest and importance is the gradual change in global equilibrium temperature. That is what is going to be melting the polar ice caps and raising the global sea level. It is a pity that we can’t take a signal. say a temperature record,. feed it into a computer and the computer produce a model of the dynamic system that produced the record. No, a computer can’t do that, but a human who is an experienced signal tracer and studies the physics of the problem can, even if there is superimposed noise. I am not suggesting that that is the way the IPCC works, but maybe it should. By the way this scientist filters out the 11 year sunspot cycle and some of the random noise. See my climate model at the address underlined above. ‘gradual change in global equilibrium temperature’. This is the sort of thing a government scientist could say. This time it is hide the hiatus. Both times it has been hide the credibility. And they continue to bury what little credibility the IPCC has left. When you conceive to decieve, you always end up with a facefull of global warming hysteria and fear mongering. Hey, c’mon cwon! Why not chill some, eh brah? Why not join The Sensible Center Of Climate Change™? You’ll be on the side of history! You’ll be on the side of “the best available science”! You’ll be on the side of the “good guys”! You’ll be on the side of now-unleashed energy entrepreneurs! C’mon, give it a try, cwon! `Cuz denialism’s ever-shrinkin’ “bubble” is strictly for losers! a frothy emotional appeal seldom suffices. Steven Mosher, are you a “friend of FOMD”? The recent debate over the future of the IPCC in 3:59. The rabid dog played, of course, by the IPCC. IPCC replaced the damning (but accurate) diagram with a new diagram in which the inconsistency has been disappeared. If global warming were to resume we now know it’s okay for scientists to speculate that the missing global cooling lies deep in the oceans. It is increasingly evident by the nature of decadal variability that there is centennial to millennial variability. It is also evident that natural variations added to warming between 1976 and 1998 – even if you simply remove the ENSO end states from the record and then calculate trend. You can safely project the resultant through for several decades to get a result that isn’t all that scary. The real problem with this is that climate is nonlinear – it shifts at decadal and longer periodicities to emergent states dependent on the interplay of control variables and sub-systems. In such a system sensitivity becomes sensitive dependence and we don’t know what that is. The sensible answer for climate sensitivity is …. wait for it… γ in the linked diagram. Michael Ghil (2013), A Mathematical Theory of Climate Sensitivity or, How to Deal With Both Anthropogenic Forcing and Natural Variability? Unless we can do both – and in a coupled non-linear context – it is simply wrong. In principle warming is not superimposed on natural variability – climate responds abruptly and non-linearly to changes in control variables. Can anyone explain me what this means concerning climate sensitivity of CO2 and increase in air temperature caused by CO2 emission etc? It means the globally and annually averaged land and sea surface atmosphere is not warming as fast as the models predicted it would. So, since the models (and the hypotheses supporting them) are correct by definition, the observations must be wrong, i.e. the “missing heat” must be going somewhere else. We do not have any reliable quantitative measurements prior to 2003 to support this, but we suggest that this “missing heat” (the difference between the model predictions and the observations) must be going into the ocean. Let’s say this was an increase of 0.06C in the temperature of 0-2000m over the past 50 years. The ARGO measurements since 2003 seem to support a slight warming in this order of magnitude (once we corrected an earlier cooling trend caused by equipment problems), so let’s go with it. PS As far as “climate sensitivity” is concerned, the statement about increased OHC means the CS estimates of the computers are correct, by definition (despite climate temperature observations to the contrary), because the non-visible warming must be hiding in the deep ocean. Most people even in Europe know that Representatives in the US Congress have a mandate by their voters to define, decide and implement politics that their voters prefer to other politics. And in a democracy it is only they who are legitimate to do so. Republican voters and politicians are exactly as legitimate as Democrats are. And now comes an arrogant fool, a nobody with no legitimacy (but apparently a democrat voter) and starts frothing at the mouth about elected republican Representatives and their “absence of touch with reality”. Well if I was a republican voter in the US, I would ask my representative to teach this fool about who has and who has not touch with reality. Of course he would not have the time to waste with some pathetic looser but he desperately needs a lesson about who decides about politics and who doesn’t. Or perhaps even like S.Mosher suggested he should start with lessons in common sense and sociability – the metaphor about straw and beam comes in mind. Judith you should kick him out of here, he has clearly very bad manners. What? A government scientist interjecting politics into his science is bad manners? What manner of government would you have? A politician can be legitimately elected and still be crazy-clueless. Those representatives have many, many clues that the catastrophic part has been exaggerated. Sorry, folks; this is a trend that is likely irreversible. The cluelessness still remains on one side of the aisle, but not likely forever; that would take craziness. It’s required to be crazy-clueless in order to be elected. Now go climb back under your rock. As to politicians, one can be crazy-clueless and still support a good policy, or the opposite. Further this quote starts out “But as you know…” I remember you picking these types of spitwads off the walls before. It is probably all a matter of perspective. When we were to see a bunch of crazy-clueless House Republican anarchists putting a gun to their own heads and threaten to blow their brains out unless Obamacare was canceled forthwith, I would probably just sit back and wait speechless to see if they would actually make good on their threats. But the problem is that through their vindictive irresponsibility, these crazy-clueless House Republicans are instead holding the gun to the heads of hundreds of seriously sick children whose chemotherapy is being discontinued as a direct result of their actions, and to the heads of thousands of other people whose livelihood is being threatened by this irrational and totally unnecessary government shutdown. Undoubtedly, there are many rational members among the House Republicans. But they need to step up and re-establish rational government. They should recognize that it is their own reputations are being tarnished by the crazy elements. This is not an example of democracy in action. Rather, this is nothing less than an unadulterated anarchistic attempt to hijack democracy by a small malicious-minded group of thoughtless idiots. By comparison, the Greeks seem to have a much more rationally functioning government compared to what we have going here at present time. I am not sure why Andy Lacis posted what he did. He comes across as an arrogant professo in an ivory tower lecturing to the ignorant masses. He gives us a bunch of platitudes, which do not address the criical issues. I am not sure what he hoped to accomplish, but I doubt that he succeeded. It’s a form of solace. A child mumbling prayers he doesn’t understand: radiative effect, radiative effect, radiative effect. kim’s right. Lacis is simply trying to console himself ever since his “CO2 climate control knob” dropped off into his hand. Try imagining how arrogant it might make you to appear when you make proclamations about some topic where you have no clear understanding of the issues involved. I work for the American taxpayer, and I take my job seriously. My job is to do scientific research on atmospheric physics and global climate change. A part of my job description is to keep the public informed of our scientific findings by means of publications in the scientific literature. It would appear that scientific publications by themselves are not sufficient to keep the public properly informed, given the deliberate misinformation that is coming from fossil fuel lobby interests, specifically designed to dupe, deceive, and bamboozle the public understanding of what global warming is, what the causes of global warming are, and what the environmental impacts of continued global warming are going to be. As I have stated before, given the large natural variability of the climate system, a statistical (only) appraisal of the existing temperature record leaves an unsatisfactory sense of uncertainty as to what exactly is happening with the climate system. That is where assessing global climate change as a physics-based cause-and-effect problem provides a much clearer understanding of how changes in atmospheric CO2 drive the global climate to change. We also look at the geological record to put current climate change in a broader perspective. Sixty million years ago, the global surface temperature was much hotter than present, and the atmospheric CO2 level was also much higher than present. When the atmospheric CO2 level dropped to about 450 ppm about 3.5 million years ago, permanent polar ice caps began to form. At 400 ppm and rising, the Earth is approaching the point where polar ice caps are incompatible with the global temperature. White the total meltdown of polar ice caps is many centuries in the future, that prospect should be sobering, even if we look only a couple decades into future. Michael Ghil (2013), Mathematical Theory of Climate Sensitivity or, How to Deal With Both Anthropogenic Forcing and Natural Variability? The real problem is human – d_ckheads who want to pontificate while at the time they seemingly are 10 years behind leading edge climate science. There are practical and pragmatic ways forward. Wanting to transform economies and societies on the model of neosocialist fantasies is not one of them. 1, scientific publications are not sufficient when authors and journals refuse to practice normal data sharing and code sharing protocols. questions about model performance, questions about the surface record, and questions about sensitivity. 3. Our collective scientific credibility is harmed when we engage in the kind of conspiracy ideation you exhibit here. You state that “authors and journals refuse to practice normal data sharing and code sharing protocols”. What exactly is it that you are trying to say? There is a great deal of climate data and climate model code that is publically available on the GISS webpage. Have you ever looked at any of it? In regard to questions and criticisms concerning climate data, climate models, climate theory, and interpretation of all of the above, that is more than welcome from everybody. That is after all how scientific progress and improved understanding happens. If you are unaware of a coordinated conspiracy against climate science, then clearly you have not been paying attention, or have been wearing selective blinders. You should also take note that there is a prominent (Republican) Senator and a number of prominent (Republican) Congressmen who have proclaimed global warming as the greatest scientific hoax ever. None of that is helpful to improving the public discourse and public understanding of climate science. But ultimately our scientific credibility depends on a clear and accurate presentation and understanding of the facts and physics that represent climate science. I thought only skeptics were conspiracy nuts? By the way, “coordinated conspiracy” is redundant. Skeptics and opponents of main stream climate science are not an uniform group. Having followed this site almost from the beginning I’m convinced that those part of a coordinated attack are a really small minority. Even those directly influenced by coordinated opposition are relatively few. Reasons for skepticism are much more varied and attacks of the type you made only strengthen that, when people feel, with justification, that an unjust attack is directed to them. My belief is that if science is to win it must win by dispassionate repetition of best understanding whenever that’s contested. What politicians say about science may be compared with what they say otherwise. The present style of political speak does not follow all traditional values in other areas either. The general public is surely aware of that. Surely it is worse than that Pekka. The entire planet seems likely not to warm for a decade to three more at least. Simple energy balance considerations suggest it is the world cooling and not just the atmosphere. Along with of course the 1998/2001 climate shift. This is captured approximately by at least one recent ocean heat reanalysis – despite the shortness of reasonable data records. The evidence seems quite strong. As Tsonis and colleagues say – quoted above – this is likely to be a significant impediment to progress on mitigation. The simple interpretation is that skeptics are more correct – and they are well aware of this. Increasingly strained post hoc rationalisations notwithstanding. And yet the Borg collective cult of AGW groupthink space cadets (BCCAGWGSC) are incapable of incorporating this as a possibility even. I think this is in part because the neo-socialist agenda requires dire and immediate threats to drive societal transformation to an ill defined model of neo-socialist utopia. Scary visions of economic de-growth and de-population. The other aspect is groupthink dynamics – they can’t possibly be wrong and give up the moral and intellectual high ground to despicable skeptics. Reality is in bum biting mode – and is very unlikely to change soon despite the fervent hopes and adherence to the simple space cadet memes. The only real compromise possible is to give up de-growth and de-popualtion. The solution is to surrender the old and failing agendas. Doesn’t seem likely any time soon.